Anand Prakash introduces Indian vintage to basic stationery and creates the most unique pieces to add a sparkle to the most of boring of days. Inspired by his own experiences and memories, Anand Prakash handcrafts bookmarks, journals, pencils and so much more. Nostalgic of Indian culture, his collections are based on characteristically Indian things such as khaki, Jaipur, the Taj Mahal and cows. His most recent Indigo collection ranges from notebook covers to pendants made with authentic architectural blueprints dating back a few decades. As part of a 5th of June Project, on World Environment Day 2013, Prakash requested people from all over the world to collect and send him newspapers in any language from all regions. 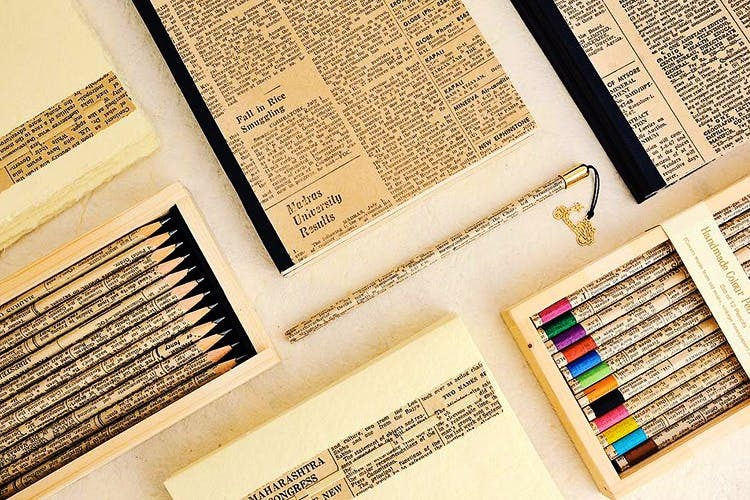 These newspapers, dating back to the 1970s collected from old libraries, were translated into a range of stationery products. The notecards, with torn edges have bamboo woven across the newsprint. With materials like that, most of the collection is bound to be limited edition. Anand Prakash also makes customised gifts, business cards, personalised and corporate stationery, gift tags, note cards, and a host of similar things. He takes ordinary things and re-designs them in his own artistic manner. The online store is the best because when you receive the delivery of a simple, gold-plated bookmark, it comes packed in handmade paper, with beautiful little cards and opening that one envelope becomes the exuberant task of unwrapping a present. They do have a physical store in Shahpur Jat in Delhi, and two in the Mumbai International Airport. If you’re as excited about checking out this new merchandise, you can get updates on his Facebook page.